My introducton to her music was the Kimagure Orange Road CDs. I think she has an incredible voice; very, very beautiful and clear. Finding things of hers is almost impossible, though, as her own CDs are comparatively old and I haven't been able to find anyplace on the net that has them, including e-bay. For the Kimagure Orange Road Movie (Ano hi ni Kaeritai soundtrack): Ano Sora o Dakishimete (Embrace That Sky); Futashikana I Love You; Tori No Yo Ni. Sound Color 1: Natsu no Mirage (Summer Mirage) and Jenina. Sound Color 3, , Mou hitotsu no yesterday (One More Yesterday). 1. Esquisse (Sketch) (1987) This has nine tracks which include (1)natsu no Mirage (Summer Mirage), (2) Passing Through, (3)Jealous Girl, (4)Be My J-Boy, (5)fuyu no Sabrina (Winter Sabrina), (6) Creation My Heart, (7)Boy, (8)Cinnamon to Brown Sugar (Cinnamon and Brown Sugar), and (9) toki ni...hagurete. 2. 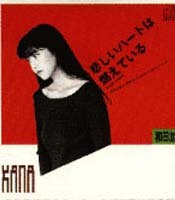 Kana (1987) This has ten tracks which include (1)Party Town-What Can I Do For You, (2)kanashii Heart wa moete-iru (Sad Heart is Burning), (3)tanjoubi wa Minus 1 (Birthday is minus 1), (4)futashika-na I Love You (Unreliable "I Love You"), (5)tori no you ni (Like a Bird), (6)Sunday Brunch, (7)fuyu no suizokukan (Winter Aquarium), (8)kanashimi no Virgin Road-Never Fall in Love (Sadness of Virgin Road), (9)Music ni kata yosete, and (1)C. Kurooderu no tsumi. 4. Vocu (1988). This has ten tracks, including (1)Mama wa Rival (Mama is My Rival), (2)Hello My Radio, (3)ano sora o kakishimete (Holding That Sky in My Arms which is from Kimagure Orange Road), (4)shitsuren-kyoushitsu (Classroom for Broken Hearts), (5)puramoderu no tsubasa (Wings of Plastic Model), (6)Lucky Love, (7)Asian Dream, (8)mukai-kaze ni (To the Head Wind), (9)Papa no Jazz (Dad's Jazz), and (1)yakusoku o Eve (Christmas Eve of the Promise). 5. Dear (1989) This has nine tracks which include (1)aka to kuro (Red and Black), (2)Dreamin' Lady, (3)Honeymoon, (4) If, (5)tokubetsu Seat (Special Seat), (6)nagareru you ni, (7)Crescent Moon, (8)La Vent Doux (The Sweet Wind), and (9)See You. 6. Dessert ni hoshikuzu no Jelly o (Stardust Jelly for Dessert)(1990). This has nine tracks which include (1)tsuki no Hotel (The Moon Hotel), (2)Good Luck Factory, (3)Convenience Boy, (4)Baby Class no Grandmother (Grandmother of the Baby Class), (5)kaze no oka (Hill of the Wind), (6)Heart de furimuite (Please Turn Back in Your Heart, (7)namida no Puddle (Puddle of Tears), (8)omoi no kakera (A Broken Piece of My Feelings, and (9) '90 1/8 Jun no tabi (Jun's Journey on 8th Jan 1990). 7. Yakusoku no Eve (1990) Thhis has four tracks which include (1)When You Wish Upon a Star, (2)Last Christmas Eve, (3)Give Love on Christmas Day, and (4)yakusoku no Eve (1990 version). 9. Wada Kanako. This has two tracks and lasts 8 min. 23 seconds. I'd like to thank Dave Sieberd ( for giving me access to Dear, Kana, Quiet Storm and Stardust Jelly for Desert. Without his help I might never have been able to listen to those cds and review them. Also, my thanks to Saiga for fixing an error in the cd listing.